For this day, we planned to go to another historical site of South Korea which is outside Seoul, that is Suwon Hwaseong Fortress which is part of Gyeonggi-do province. As I preferred our way to go to this place without getting tour, we ended the tour with pride because we accomplished something in this fortress and here’s what happened to us. From hotel, we took metro train which was our usual mode of transportation while touring around Seoul. And that time, we did the same thing when went to Suwon. We started at Non-hyeon station which is Line 7 going to Bupyeong. We transferred in Line 1 at Gasan Digital Complex (GDC) and then we got off at Suwon station where AK Plaza is also located. At the front of the plaza I tried to inquire how to go to Hwaseong Fortress and they mentioned to us to take a bus. The people at information center gave us the bus number. When we were out of the Suwon station, it seems the front of the AK Plaza are like crossing roads which means it’s a busy road since it’s near in the mall and you can find as well some public transport terminal around the area and we are confused where to find the bus that will bring us to the fortress. After inquiring with one of the passing students, she helped us and we crossed the road Maesan-ro. We found our bus and we were able to use our T-money card. It took us few more minutes until we were dropped off at the front of Hwaseong Haenggung Square. Here we found Hwaseong Haenggung information center at the front of the main gate. We bought tickets that combined overall access to the Hwaseong fortress. Our adventure started at lunch time and it’s a beautiful sunny afternoon. Using our mapping tour we started our walk from the gate of Haenggung. Haenggung sometimes called as temporary palace or detached palace, because this palace serves as palace of the King when the King was not at the capital during Joseon dynasty. The famous king who requested this fortress to build was King Jeongjo (or widely know as Yi San in historical drama). 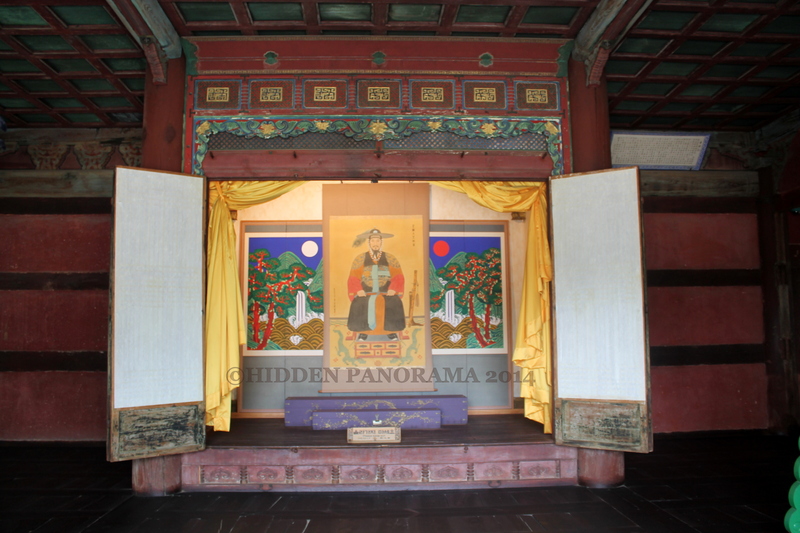 Once we entered in Haenggung, the first thing we noticed were two famous characters played in Daejanggeum (Jewel in the Palace) drama standing in the corner which located at Jwaikmun (the area after you entered the main gate or entrance called Sinpungnu). They are Lee Young Ae (Seo Jang-Geum) and Ji Jin Hee (Min Jung Ho) in their character outfit. Since they are famous, people visiting the place will stand either between them or at the side to have souvenir shots even though it’s just photos of them and not real. We took photos of ourselves as well when it’s been our turn. Then, we turned right and found Jipsacheong, based on the map that we have in our hand, Jipsacheong was an administrative office for jipsa, specialist for royal rites and reception at temporary palace. Here we saw dolls displayed covered with glass. Those dolls portray different kinds of clothes wore by Royal family (like King and Queen) and other Joseon court officials. There was a tree standing near the entrance to Jipsacheong and we found some information displayed there about the said tree. And it’s amazing information we found, the tree is called as “The Zelkova Tree” is more than 600 years old and been there even before building the Hwaseong Fortress. Next, we went to Jungyangmun area which is the next area after Jwaikmun. Here we saw Royal Guard standing in the middle at the front in the entrance to Bongsudang. We walked until we reached Bongsudang. From the map guide that we have, Bongsudang is the main hall you can find in Hwaseong Haenggung. And here, the 61st birthday of the mother of King Jeongjo was held. Based from the information displayed near the building, Bongsudang was the most important building of the temporary palace and it was where King Jeongjo stayed when he visited Suwon. After looking around the area of Bongsudang, we turned right and went out at the right side, where we found Naknamheon. It is said that this building was the only building in temporary palace which was not destroyed and remain intact on its original form. This building was specially designed facility for various events such as state examinations and banquets for old people during Lady Hong of Hyegyeonggung’s (mother of King Jeongjo) 61st Birthday Ceremony. Beside the building of Naknamheon, is Noraedang and I learned that this building were created as King Jeongjo wanted to live here in his old days after abdicating from the throne. Next building in Noraedang is called Deukjungjoeng. 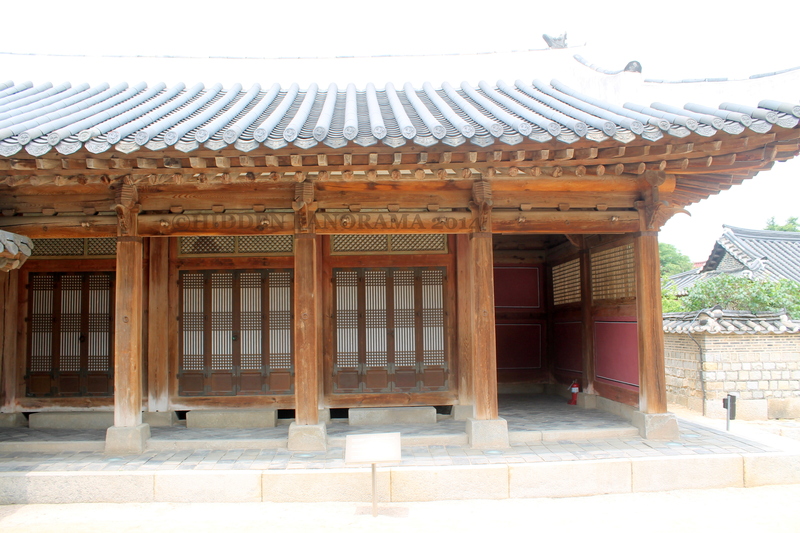 At the front of the said building, King Jeongjo practiced archery, it was named after the king hits the bull’s-eye. Afterwards, we found a way to the hill-side (which is part of Mount Paldal) just behind Hwaseong Haenggung. Out of curiosity, we followed the track to the top to check if we can see something there. On the way to the top, we saw Naeposa – a facility acted as beacon informing impending danger for residents in the fortress and Mirohanjeong – a place to live retired life quietly. From the top, we went down and found another site near Haenggung. Based from our map guide, the area is called Hwaryeongjeon and this is where King Jeonjo portrait is enshrined by King Sunjo (son of King Jeonjo). In the vicinity we found different building where more information can be found. Jejeong is one of the royal well. Woonhangak used for morning assembly and enshrined of King Jeongjo. Iancheong where portrait of King Jeongjo was keep every time it was removed in the main building. Pungwadang Guest Residence used as a living quarters for a specialist for the rite. Then, we went back to Hwaseong Haenggung and continued our tour to the other parts of the temporary palace. We found Jangrakdang which beside Bongsudang. Hyegyeongjeong Hong stayed in the building. Here King Jeongjo celebrated the 60th birthday of her mother with the will to live with his mother after abdicating the crown to his son King Sunjo. We went around behind Jangrakdang and Bongsudang. Here we found different servant’s quarters. Then, found Boknaedang where local officials’ family stayed. Bongnaedang Kitchen, where kitchen equipment in that period are displayed. Then, we moved along and found the display of different Korean dress used by Jang-geum in the historical drama (Jewel in the Palace). Then we found Angbuilgu which is a sundial and it was created in 1434. Then, we moved to another area and we saw Yuyeotak. 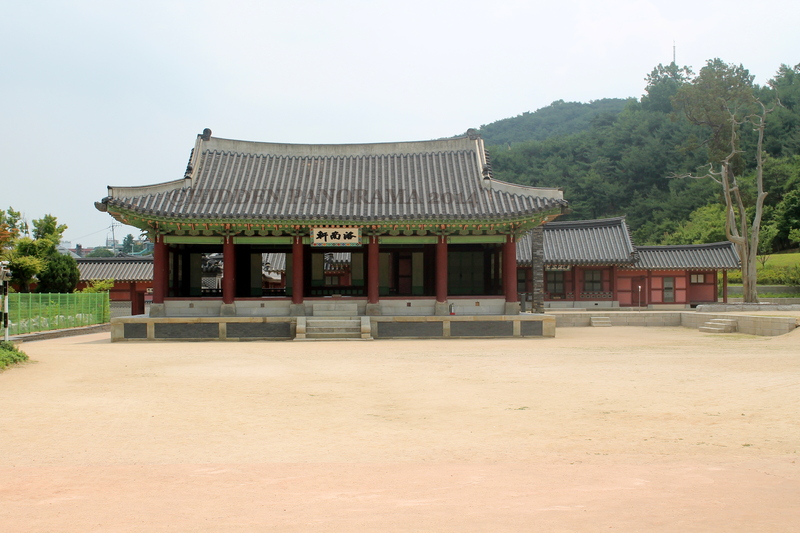 Here, King Jeongjo stayed here to interview his subjects during his honor visits. In the same area, I found interesting and familiar thing, it is the Rice Chest. It was familiar to me because I once saw it in the film of Yisan and Eight Days where the father of King Jeongjo, Crown Prince Sado were put to death by his grand father King Yeongjo. We continued our walking tour to the next area and discovered Oejeongriso. 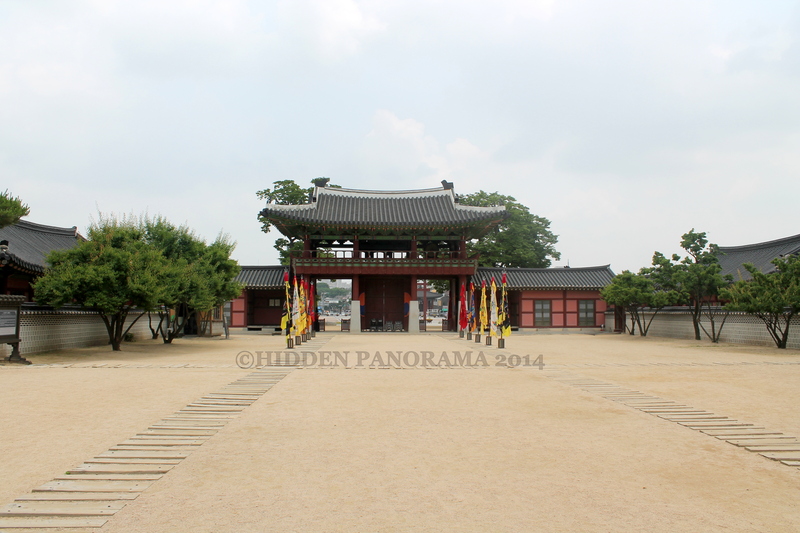 This is where events in Hwaseong Haenggung were arranged during the King’s honored visit. Another vicinity area beside Oejeongriso is Bijangcheong which used by officials’ assistants. Next is Seoricheong which served as office of seori, clerks and petty officials who record, issue and received documents. Namgunyeong which is a government office and the 100 cavalry soldiers of the Royal Guard stood on guard. While touring inside Haenggung, in every part of the temporary palace, there are visitors like us that they go to each area with paper and they put stamp on it. I just realized that we never did the same thing. Since we were waiting for the Martial arts performance show at the entrance gate, I request the paper for Tour stamp from the information center and I go around again quickly in Haenggung to look for all the station where the stamp is located and immediately put the stamp in the paper. Then I went to Experience Tour ticket to laminate the paper as my souvenir in the palace. Well, when I did that, I felt like I am a kid receiving a reward because I finished the tour inside Hwaseong Haenggung. Most of the tourist went outside Haenggung and stayed near Sinpungnu (entrance gate) because all of us were waiting for the 24 Martial Arts Performance which scheduled to play twice a day. The martial arts to be displayed were from the Martial Arts book created by Silhak Scholars and Baek Dong Soo (master of martial arts – I watched the historical drama too) which ordered by King Jeongjo. These martial arts are from Joseon Dynasty, China and Japan. The performance started and I watched intently until the show was over, I enjoyed the whole show. The continuation of the walking tour along Hwaseong Fortress will be describe in another post following this one. Until then.